← What kind of transformation do we offer? and you keep asking yourself: what should I do now? You want healing from passive aggression! Now, you need to move into decision mood! Does it happen to you that you feel trapped by the same repetitive situations in life? Constant fighting with your wife is one of the most commons, not a lot of fun, but it happens almost automatically, and when you less expect it… As the worst kind of action in life is inaction, if you are experiencing a long-term confrontation in your marriage, and it’s taking its toll, the time for action is now. I work primarily with men who are at a crossroads in their marriage. For them, communication with their spouse has faltered. At the same time, his wife is pressing him about an issue that she feels needs resolution. She pressures and prods him to accept and heal his passive aggression, only to cause him to feel accused, shut down and shut her out. Behavior on both sides keeps escalating into rejection and contempt, and the union is slowly dying. You can hear often that: “You can only influence other person’s behavior if you change the way you treat her.” If you accept this axiom as true, then you could try to change your mindset and your approach to her claims, so her response to you becomes more appreciative and respectful. Here I offer you my coaching program to change difficult situations at home and provide more peace and respect. When you immerse yourself in this pioneering program, you’ll begin walking on a structured path that will ultimately result in understanding the origins of your passive aggressive behaviors, learn and use better communication skills here and now with your wife, feel more comfortable expressing your true feelings, and enjoying your relationships more than ever before. Complete a self-assessment of your communication style. Identify the origins of your mental models and current beliefs. Watch how old emotions create problems now, release them and learn positive tactics to face conflicts with ease. Recognize when and how passive aggressive behaviors happen. Your coaching sessions will be pressure free, relaxed and informative, with tasks of self-reflection to follow up. Many clients find that the first coaching session provides them with such a panoramic vision of their relationship dynamics that allows them to shift to a perspective they’ve never had before. The following sessions will be supported by immediate answers to your question, short phone calls or messaging by What Sapp, so you will receive the necessary coaching just in time. Twice a month 50’ session where we will map your conflict, design a game plan, then list the steps necessary for you to do, and what results to expect. You will have to do your homework and compile questions for the next phone session. A detailed framework in four lessons to better understand passive aggressive traits, why they manifest, and how to correct them. Revolutionary tools that work to produce steady, positive behavioral change. Success stories of the men (and their happy wives!) that have used this model to change their lives and rescue their marriages. 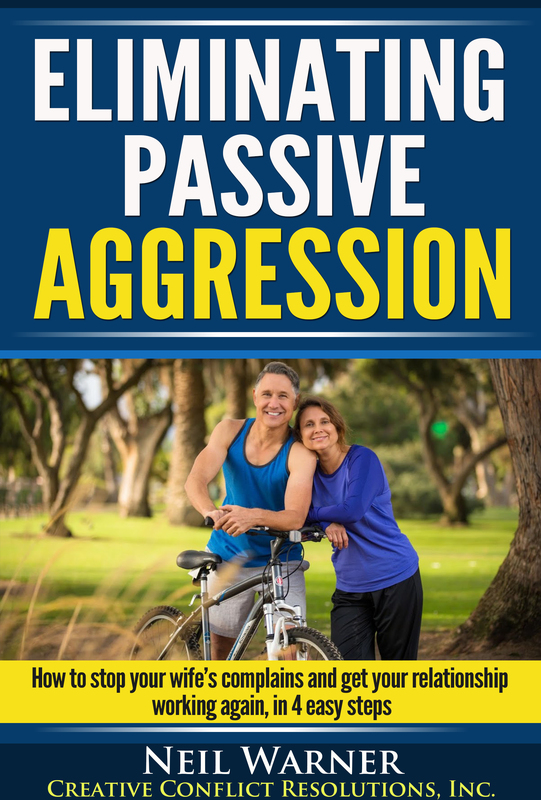 This book explores how passive aggression starts as a useful defense mechanism and how you can correct it. The book contains practical applications of each concept, easy to read and understand. No psychology classes or dictionaries are required! It is your guide to understanding and changing your communication style from passive aggressive to a healthier form that will benefit both you and your wife. To maximize your benefits from the book, you will also receive the companion manual. Use this powerful tool at the end of each book chapter to further reinforce key concepts and apply what you’ve learned to your own situations. The exercises in the workbook show you how the book’s lessons apply to everyday life. Use the workbook to gain valuable insight about past experiences and understand how those experiences have shaped the way you think in the present. For certain exercises (discovering the roots of hidden anger and discovering the past anger targets, for example), you will be personally guided by your coach. They will provide you with specific insights about your situation based on many of the answers and scenarios you create in your workbook. You can start healing your passive aggression now! YOU WILL RECEIVE THE EXTRA HELP MANUAL: “Healing Words To Communicate Safely With Your Wife,” that teaches you how to solve uncomfortable silent moments, keep a conversation going, and the right words and phrases to connect emotionally with women. WHAT CAN YOU DO NOW? THE NEXT STEP IS IN YOUR HANDS! Remember, the peace of your marriage awaits. The sooner you start this proven program, “MY HEALTHIER MARRIAGE COACHING PROGRAM,” the sooner you put real marital misery in the past. Don’t let passive aggression stop you and your partner from having the marriage and home life you’ve always dreamed of having: peaceful and respectful for you, and emotionally satisfying for your wife. Get in touch with us today for what you can do! PS: Want to discuss how to get this kind of results? Book your free 30’ coaching session today. P.S. I understand that it might be scary for you to take the first step by clicking on our link – because it means you accept you want more from your marriage. As in more communication, more understanding, more JOY! I hear you. By having this free session with me, you can put yourself on a path to a happier marriage and more joyful life. And who doesn’t deserve that?! Besides, you can end up with a new, more positive understanding of your situation that brings hope to your life! This entry was posted in Stop passive aggression and tagged am i passive aggressive, conflict coach, hidden anger, how to stop being passive aggressive, human needs, passive aggression, passive aggression test, passive aggressive behavior, relationship conflict, relationship repair, stop your passive aggression. Bookmark the permalink.